In 2017 you proved that when community comes together, we are unstoppable. And we will not stop. Are you with us? 2017 brought it on. Divisive rhetoric turned into violent clashes in the streets of Charlottesville, harmful policies tore families apart, and multiple—albeit unsuccessful—attempts were made to weaken the constitutional rights and founding values of our Nation. Yet, it was in the face of so much pain and devastation that the power of love ignited a courageous movement of action, kindness, and generosity. For the LCF team, our community partners, and allies, 2017 will be defined by this courage— a courage that fueled our determination to Rise Up and Lead with Purpose. These are not ordinary times. The demand for all of us to act bravely goes beyond a moral imperative. It’s time for California to live up to its progressive ideals. The world is watching. And, our commitment to equity is about safeguarding our democracy for this and future generations. LCF trusts grassroots leaders and invests in Latino-led organizations that advance opportunities for the next generation of Latinos in California. Through the groundbreaking Latino Nonprofit Accelerator, a fundraising and marketing incubator, LCF provides mentorship, strengthens infrastructure, and builds courage to help leaders reach their biggest dreams. LCF works to amplify the voice and power of Latinos in California. We are committed to strengthening our democracy by increasing Latino political participation and advancing a progressive policy agenda towards equity. We invest in youth and civic participation, lead voter mobilization campaigns, and create opportunities for Latinos to inform local and state policy. Latinos are the backbone of our democracy and economy. It’s time to leverage this power to shape a more equitable future for California. LCF leads the largest network of Latino philanthropists in the country. Driven by a sense of justice and generosity, the Latino Giving Circle Network® has invested $700,000 in Latino leaders working to create opportunities for youth and families to fullfill their highest potential. In 2017, LCF unlocked the power of this growing network, which now includes 450 philanthropists across 15 Giving Circles throughout California. Thanks to you, we doubled our grantmaking in 2017, expanded our statewide presence, and launched the first-ever Latino Nonprofit Accelerator. Thanks to you, we lifted the voice of our Latino-led nonprofits from Los Angeles, to Fresno, to Santa Rosa. Thanks to you, the Latino Nonprofit Accelerator received national attention as a groundbreaking incubator for organizations building power in our communities. Thanks to you, we delivered on our promise to triple our grantmaking in the Central Valley and Central Coast, the heart and soul of California. When Martín, a farmworker and student from Watsonville, walked into Digital NEST looking for a job, he did not know his destiny would change forever. Working the front desk, Martín took advantage of the classes offered at the NEST. He uncovered a new world of possibilities and tapped into a passion for technology. He became a mentor and leader at the NEST, while he also pursued new dreams and aspirations in the tech sector. Today, you can find Martín in San Francisco at the Adobe Digital Academy. Martín is one of the 760,000 Latinos whose lives are transformed through the relentless work of our partners. Thanks to bold leaders like you, we fought courageously to elevate the voice of Latino immigrants at a critical moment in our nation’s history. LCF hosted the largest Latino Policy Summit with Attorney General Xavier Becerra. One of our speakers, Wendy Carrillo, reminded the audience: “You don’t need to wait to get tapped on the shoulder for someone to tell you it’s your turn to run.” It was Wendy’s turn to win, today she serves as a California State Assemblymember representing the power and ingenuity of our community. After the Summit, we marched together to the Capitol where LCF led 66 legislative visits with our community partners. Young people met with legislators like Pro Tem Kevin De León and Senator Ricardo Lara, who encouraged our youth to stay strong and focused. In 2017, LCF also established the Nuestro Futuro Fund to protect immigrant rights and invest in youth-led advocacy. 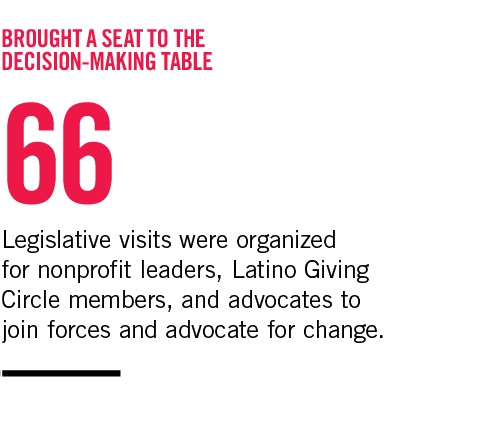 It was a record year for Latino philanthropy. In the throws of anti-immigrant attacks and devastating natural disasters, we stood strong and took action with our money, time, and talent. Thanks to you, LCF raised $4.5 million to advance our collective vision for Latinos in California and support our communities. The Latino Giving Circle Network® launched new circles in LA and Sacramento. Over 75% of grants supported civic engagement and leadership development. Immediately following the wildfires in Northern California, LCF was the first to launch a relief fund for immigrant families affected in the region. Thanks to you, these resources are being invested in Latino-led nonprofits driving an agenda for a just and equitable recovery. I’m in! – said José Antonio Ramírez eagerly, signing a $1,000 check and officially launching the Central Valley Latino Giving Circle. Everyday we are motivated by champions like José Antonio who will stop at nothing for his community. Besides his public service and family commitment, he is consistently recruiting members to join the movement of Latino philanthropists and drives across the state leading conversations to engage new partners and allies in this work. That is the Central Valley spirit and why their Giving Circle has made history. In 2017, José Antonio took his committment to the next level and joined the LCF Board of Trustees. LCF’s work is grounded on the knowledge that art and culture play a vital role in driving social change. Culture is at the center of our work. We use the power of digital media to transmit stories of hope, vision for change, and opportunities for action. Thanks to you, in 2017, we built a stronger community of Latino changemakers driving a new narrative in social media. And, when we came together, we built altars to honor our past and present victories, broke bread, danced, and celebrated the richness of our diverse heritage. These moments encouraged us to lead with boldness and dismantle hate with love. Over the past year, individuals, foundations, and corporations came together to invest $4.5 million to unleash the power of Latinos in California. Support the mission of the Latino Community Foundation. Become part of the movement of Latino philanthropists making a difference. Get informed, get registered and vote on June 5th and November 6th!